Suspension completely rebuilt, every bushing, tie rod, ball joint, nut and bolt. The front was lowered by 15/16" and had short narrow tires put on to help the rake of the car. The rear suspension was modified, with some fairly big changes in the geometry of the suspension along with major changes in spring rate. 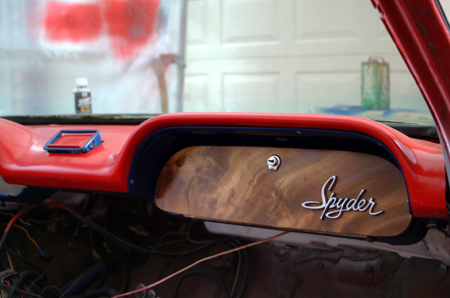 New wooden dash & glove box door were made. 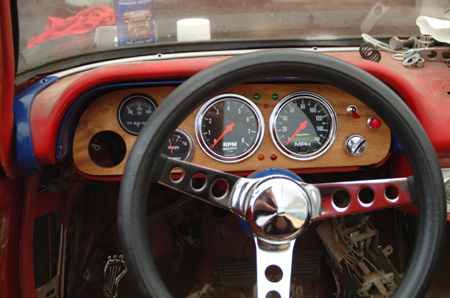 All instrumentation is provided by Autometer, including tach, programmable electronic speedometer, fuel level, volts, cylinder head temp, oil pressure and temp, etc. The trans is a 1966 Saginaw 4 speed. The differential is a 4 spider posi with billet steel side cover, 3.55 gears, and the aluminum diff top cover. The engine is a mostly stock 110 motor from a 64. Heads have pocket porting on the intake and exhaust. The cam is an Isky cam with 208 @ .050 duration and .417 lift. The heads have been milled to bring the compression up to 10.5:1 with the polished chambers. The pistons are 2.2 Mopar pistons with turbo rings. The block was plate honed .0375 oversized to match the Mopar pistons. The Mopar pistons were used because I needed pistons with a larger pin, to better fit my 40+Year old rods. The Mopar piston was very close to the original Corvair except it has a .900 pin rather than the Corvair .800 pin. It was the perfect choice. 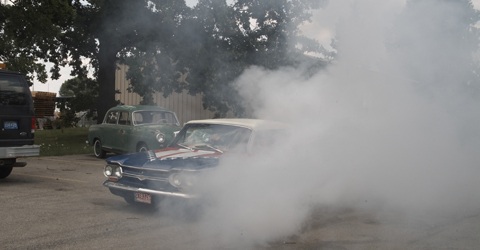 The car in street trim, running only 2 original carburetors, weighing about 2700 pounds, runs in the mid 16's.